Chi Machine - Aerobic Exerciser - you lie on a rug, and let it do the work! I want to share with you one of the two greatest Wellness Therapies I’ve ever found in my 30+ years of being a holistic healing practitioner. 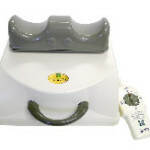 It is the original Sun Ancon “Chi Machine®” – Aerobic Exerciser. This is one of the best products for overall health that you can buy, and I’ve been using it since 1998! Five minutes on this machine is equal to a half-hour walk, aerobically speaking! Thus, 10 minutes = equivalent to a 1-hour walk, etcetera. The Chi Machine is patented, trademarked, and registered as an Oxygen Exerciser / Medical Apparatus Aerobic Exerciser It is known worldwide and was featured on The Doctors TV show, which presented this segment about the Chi Machine. It involves NO side effects, disrobing, danger of injury, needles, medications, or anything else that is invasive. It’s harmless, helpful, and restorative. What to Take in an Emergency – the Chi Machine® – Aerobic Exerciser? Yes/No? Truly, I kid you not: if there were a catastrophic emergency at my home, and I had five minutes to choose what to take with me during my grand escape, the chi machine (along with the cats and credit cards) would be highest on my priority list. Why? Because of all the physical symptoms with which it helped me. I have had my Chi Machine® – Aerobic Exerciser for many years, and it worked just as perfectly as the day I got it until it fell out of my car and got slammed dunked onto the pavement. In other words, it has paid for itself over and over again, both in financial terms and in terms of health benefits! The cost was about 8 cents a day over that time period. For ordering information, scroll down. Japanese scientist, Dr. Shizuo Inoue, conducted 38 years of research on this process and is credited with the idea of providing a machine to swing the feet, causing a sideways oscillation of the pelvis like the undulation of a fish swimming. He understood the benefits of “passive aerobic exercise” and developed the only true Chi Machine®. He believed that lack of oxygen in the body is a primary cause of diseases, and many doctors now agree, including Nobel Prize winners, Dr. Warburg and Dr. Odeuale. How Do You Use the Chi Machine® ? The machine is a breadbox-size device with an “ankle cradle” that moves from side to side at approximately 140 oscillations per minute. You just lie flat on the floor and rest your ankles on top of the ankle cradle. Beginners may use it for just a couple of minutes. People who are more accustomed to it can use it for twenty minutes, at which point, it is believed that the perfect Ph balance will have been reached. Each of the three positions shown below creates different effects. I add some more hand and arm positions plus move my mental concentration in other ways with amazing changes in how it feels – for the better! You have to experience it to know what I’m talking about! It is so surprising! The key to getting maximum health benefits is to remain lying down for a couple of minutes after the machine stops and then do a few, specific spine-stretching exercises before slowly getting up. See for yourself in this video. The Chi Machine® oxygenates and detoxifies the body via “passive aerobic exercise.” It activates your lymphatic system, which is the system that cleans out the poisons and debris in your body. It also aligns the spine via the figure eight motion caused by the specific oscillation design of the machine. 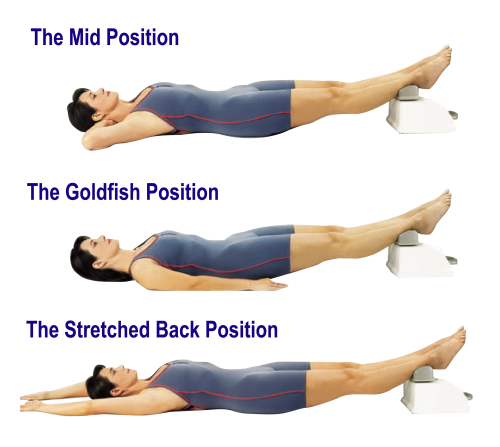 This “goldfish” motion has helped me with temporary muscle pain relief from soreness, tension, fatigue, poor oxygenation, sluggish circulation, need for stimulation of the autonomic nervous system, and metabolic waste elimination. As reported by many others, it also helps with mental focus, better sleep, plus quick relaxation and stress release. When you move your body (especially in physical exercise) you activate circulation which drives blood through the body. That provides oxygen and nutrients to your systems. Similarly, the lymph system is like the body’s sewage system. However, it has no equivalent to the heart which pumps to move things along. Aerobic exercise forces the lymph glands and fluids to work, moving waste to the portals of the body where it can be removed. This helps keep you cleansed, so the accumulation of waste in your body does not stagnate and begin to poison you from within. 2yr Warranty – Lasts 15-20 yrs. It has a carry case (cost extra) for those of you who travel or want to share use with others. This is a testimonial I wrote years ago about the same “chi machine.” I am embarrassed by how gushy it is, but it all was/is true. This amazing aerobic exerciser provides great health benefits through oxygenation and circulation in the body. I don’t know what it will do for you. I just know what happened when I used it consistently for a few days. Here’s what I said. I have discovered a life changing – perhaps life saving – exerciser that actually lives up to its claim that “It does the work. You get the benefit.” It works by greatly enhancing the distribution of oxygen and blood flow throughout the body, thereby changing your metabolic rate, and rejuvenating every aspect of your body, while you just lie on the floor (resting your ankles on the machine), breathe deeply, and think happy thoughts for fifteen minutes! Are You One of These People? It is great for people who don’t have time or want to exercise or who are self-conscious about their bodies and want privacy. I would not have believed it, had I not experienced it myself! Since at least 1990, I have suffered from Chronic Fatigue Syndrome. At first, I thought it was just exhaustion from working a 40 hour week and another 40 or more hours in the same week doing volunteer work at a shelter for homeless people. (I had done that every week since 1987.) But, in 1992, I discontinued most of that volunteer work and my community service work. Yet, in 1994, I had become so ill that quite literally my consciousness left my body. I lost so much weight, people started the rumor that I had AIDS. I constantly needed to sleep for 4-6 hours after having been awake for only five minutes. It has been a very slow recovery. Every day – no matter how scorching hot and sultry humid – no matter how frigid the winter – I have had to go to my car and sleep during my lunch hour in order to make it through the rest of the afternoon’s work. And, I have done that, since at least 1990, even while fearing that sleeping in the parking lot could cost me my job. Still, it was necessary. …Until I got this “chi machine”… Almost immediately, I did not HAVE to take a nap during my lunch hour! In fact, if I tried to, I could not go to sleep! I suddenly had sufficient energy to get through the whole day at work and an entire evening of work at home, and the energy was alive and evenly distributed throughout the day! It feels just like a miracle! On the fifth day, I discovered I had lost 1/2 inch in my chest, waist, and hops, and THREE inches in my abdomen!! !… you know, where men have a “pot belly,” and women look like they will be pregnant until they die. I know, because I matched my measurements against measurements I had taken one month previously. During this time period, I had not been exercising, because of a back problem. And, I had been eating beau coup ice cream and butterscotch syrup! The only thing that had changed was my having the chi machine to use 15 minutes* in the morning and again in the evening. Speaking of That, How Long Should You Use It? Another note: I have been exercising fairly regularly since January, 1998. Rather than losing weight, I gained both weight and inches. Depressing! I guess I must now have muscles AND fat! Consequently, I could not wear my business suits. Nor could I afford a new wardrobe. So, this loss of inches is a real blessing, even though I think I weigh the same number of pounds. An x-ray of my back showed osteoporosis (probably created or worsened by my having smoked cigarettes for many years), arthritis, and bone spurs from the injuries. The arthritis literally was dislocating my ribs! And, now one hip is much lower than the other. I was a hurtin’ buckaroo! It felt like my back was on fire all the time, and I could hardly get to sleep, much less stay asleep at night because of it. After ONE WEEK of using this chi machine, I certainly am not completely cured, buy I am ALMOST PAIN FREE! I had experienced acupuncture, cranio-sacral therapy, deep connective tissue therapy, Reiki, Kahuna healing, chiropractic, and massage. Everything helped a lot, but then the pain returned. We didn’t know why until we saw the x-ray. It was the machine that worked out the crooked ridges in my back and reduced the pain. The person who massages my back with peanut oil can see the differences clearly. The varicose vein in my ankle is receding and is far less visible. The bone spur on my foot is receding. Every day I see a difference, and often I am pain-free. My vision is improving and my range of peripheral vision is greatly increased. I know this because of an exercise I tried, which I can do far better than I could just a few days ago. The area where I had oral surgery is healing at a much faster rate. It is helping me with lymph drainage. An energy healer who had worked on me a couple of months before I got the chi machine was amazed at how much clearer and healthier my energy field is. It is helping me cleanse and clear not only body, but mind, spirit, and emotions. I CAN SLEEP MUCH BETTER AT NIGHT! Internal (digestive) organs, heart, lungs and immune system feel stronger and clearer. I’m sure this is only the beginning. The literature states that 15 minutes of using the chi machine is about equivalent to 90 minutes of walking, in terms of body oxygenation. All I know is IT WORKS! A major clue in health evaluation is that your nails and hair are the first to show damage when the body is under stress. They become dry, brittle, and split. The body needs to devote its attention to the vital organs and systems, so they will be served first by the functions of your immune system. I am susceptible to that pattern. However, when I use the chi machine daily, my hair and nails begin to grow and show good health again – within a day or two. The last thing I ever wanted to be (even less than I wanted to be a secretary) is part of a multi-level marketing operation. But, I literally believe the chi machine can benefit almost every person of any age and can save the lives of some! The machine is not cheap. But, it costs less than much of the exercise equipment seen on television – – – or the price of the spa I joined and then went to about three times – – – or the price I pay for vitamins and supplements every 2 months! Again, the price worked out to about 8 cents a day, as the machine lasted in perfect condition for many years. Occasionally, there is a sale of about $100 off the normal price. To me, its aerobic benefits can reverse major symptoms; therefore, is worth much more than I paid for it. Plus, it’s a one-time expense and can be used by many people! If you are interested, see the options below for ordering one for yourself or as a beautiful gift for almost anyone else. It’s great for “the person who has everything” and for people who cannot or will not exercise. FREE Footrest Cover, E-Books, Video. 14 days FREE TRIAL from the day of delivery. Money back guarantee if returned. from the HTE head office Los Angeles, CA. HTEAmericas is the home office in the USA for sales. It is where they answer questions from distributors. The people who answer the phone have always been very polite, helpful, and truly lovely over all these years. I’m not “a phone person.” I hate having to call for help or to order things. But, this is different. I actually look forward to talking with them and never feel intimidated or as if they were uncaring. They want to help and they do help graciously. Instead of choosing Shopping Cart, you would go to “My Account” at the top of the page, and the system will guide you through signing up – again, using my name and Sponsor / Distributor number A106795 to associate you with me. Thereafter, the annual fee to remain a distributor is $25, at the time of this writing (2-22-2019). HTEAmericas provides a 14-day money back guarantee with a 2-year warranty on The Chi Machine. All HTEAmericas products are repaired serviced in the US & Canada! If you are interested and want more information, contact me at MyPersuasivePresentations@gmail.com. To order it through me, you need my name and Distributor number and to contact the legitimate company office, per instructions above, so I cannot utilize PayPal options on this website. I’ll be happy to give you more details, including a place on YOUTUBE where you can get great instructions for use. To check out their other products or to ask questions if I’m unavailable, here is more contact information. Hsin Ten Enterprise USA, Inc.
DISCLAIMER: Neither I nor this website makes any claims about prevention, diagnosis, treatment, or cure for physical illnesses or symptoms. I am merely recounting my own experiences after having used the chi machine. This content is for informational and educational purposes and does not provide individual medical advice. Contact your health provider with any questions about your situation and any products you choose to use. Here’s to your good health!